Art In Motion, a special event art initiative brought local and national artists, businesses, community and art organizations, schools and individuals together in an unprecedented way to have fun and celebrate the Indianapolis 500. Over 80 sculpted and decorated race car replicas were placed in the greater Indianapolis area. Fifty schools participated by creating miniature art cars. Artists submitted 300 proposed car designs for the official “Art In Motion.” Artists went “car-azy” with their designs. Race and art fans of all ages were in awe and giggled with delight and took thousands of photos as they walked around looking at the cars, each more creative than the last. The depth and creativity of our artists was well represented in the exhibition. Race cars were transformed into animals, mosaics, landscapes, jewels, and fanciful representations of the greatest race in the world. Several were painted to represent Indianapolis and Indiana scenes. Well known characters made appearances in Art In Motion; Garfield the Cat, Picasso, Ike Behar, and David Letterman. 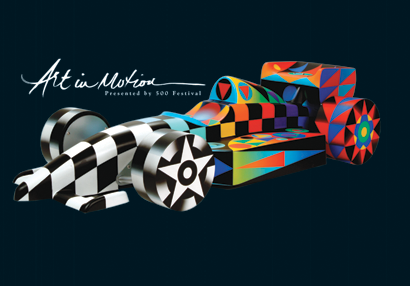 Art In Motion was produced by the 500 Festival, a private not-for-profit community organization that plans events and programs celebrating May in Indiana and the Indianapolis 500. Most importantly, Art In Motion was about residents and visitors having fun and sharing in the history of racing in Indiana.